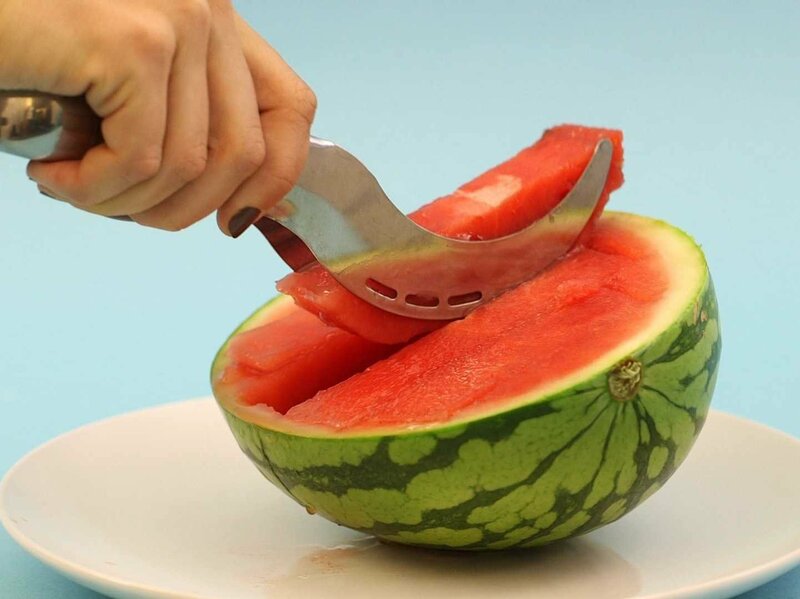 Cut Up Your Watermelon With Ease Easily slice into your watermelon allowing you to scoop and cut out pieces.Just simply press into the waitermelon adown to the rink to cut and once youhave your piece clasp the tongs around it to serve. Slice, Skin and Serve ALLIn One Dishwasher Safe and Safe For The Whole Family Get the most out of your watermelon with this handy little utensil with nosharp edges the whole family can use it. These set of tongs are completelyStainless Stell and Dishwasher Safe so when you are finished just simply throwthem in the dishwasher and they will be clean for the next use 2 Tools In 1 Appreciate immediately the kitchen utensil that combines the functionality ofa knife with the handiness of tongs to serve slices of watermelon. Stainless Steel The stainless steel structure will preserve form, function and shine at everyuse: an accessory for your kitchen to use forever. Nickle Free Made in accordance with procedures and using materials that are suitable forallergy sufferers. The Watermelon Slicer How To Instructions 1. Hold the tongs by the handle with the blades curving downwards 2. Press into the watermelon at the furthest part of the rind and pull towardsyou with the cutter moving along the entirety of the rind. 3. Cut as many slices as your desire. 4. Turn the Watermelon Slicer over so the blades are curved upwards and use asa pair of tongs to pick up the watermelon slices 5. Enjoy your watermelon with no wasted fruit.